Pandit Deendayal Upadhyay was a profound Indian philosopher, economist, sociologist, historian, journalist and an eminent political activist. He was an organizer par excellence and a prominent leader of Jan Sangh who maintained the highest standards of personal integrity. Pandit Deendayal has been the source of ideological guidance and moral inspiration for the Bhartiya Janata Party since its inception. His treatise on ‘Integral Humanism’ is a critique of both communism and capitalism, advocating a holistic alternative perspective for political action and statecraft consistent with the laws of creation and the universal needs of the human race. He was born on 25th September, 1916 in the village Nagla Chandrabhan (now known as Deendayal Dham) of Mathura District, Uttar Pradesh, India in a lower middle class Hindu household, Deendayal Upadhyay (fondly known as Deena) belonged to a family of distinguished individuals. His great-grandfather, Pandit Hariram Upadhyay was a legendary astrologer. His father, Sri Bhagwati Prasad, was an assistant station master at Jalesar and his mother Shrimati Rampyari was a religious lady. Deena’s father died when he was less than three years old, and his mother before he was eight. He was then brought up by his maternal uncle. Deena also had a younger brother named Shivdayal Upadhyay. Shivdayal contracted smallpox and despite all efforts, Deendayal could not save him and as such, was left all alone as his brother breathed his last on November 18, 1934. Having lost both parents in early childhood, Deena excelled academically under the guardianship of his maternal uncle and aunt. He later went to high school in Sikar from where he matriculated. He stood first in the board exam and the then ruler, Maharaja Kalyan Singh of Sikar, presented him with a gold medal, a monthly scholarship of 10 rupees and an additional 250 rupees towards his books, as recognition of his merit. Deena passed his Intermediate Board Exam in 1937 from GD Birla college, Pilani which later would become the prestigious Birla Institute of Technology and Science (BITS PILANI). He graduated in first division from Sanatan Dharma College, Kanpur 1939 and joined St. John’s College, Agra to pursue a master’s degree in English literature. In the first year, he obtained first division marks, but was unable to appear for the final year exam on account of a cousin’s illness. His maternal uncle persuaded him to sit for the Provincial Services Exam, which he passed and he was selected after an interview. He chose not to join the Provincial services, as he was fascinated with the idea of working with the common man. At the instance of her aunt he took a Government conducted competitive exam in Dhoti and Kurta with a cap on his head, while other candidates wore western suits. The candidates in fun called him “Panditji” – an appellation millions were to use with respect and admiration in later years. Again at this exam he topped the list. Armed with his uncle’s permission he moved to Prayag to pursue B.T. His love for studies increased manifold after he entered public service. His special areas of interest were sociology and philosophy, seeds of which were sown during his student days. While he was a student at Sanatan Dharma College, Kanpur in 1937, he came into contact with the Rashtriya Swayamsevak Sangh (RSS) through his classmate Baluji (Balwant) Mahashabde. Only there he met the founder of the RSS, Dr. Hedgewar. Hedgewar used to stay with Babasaheb Apte and Dadarao Parmarth in the hostel. Dr. Hedgewar invited him for an intellectual discussion at one of the Shakhas. Sunder Singh Bhandari was also one of his classmates at Kanpur. This gave a fillip to his public life. He dedicated himself to full-time work in the RSS from 1942. Though having earned his B.T. from Prayag, he decided not to take a job. He had attended the 40-day summer vacation RSS camp at Nagpur where he underwent training in Sangh Education. Deendayal, however, could not withstand the physical rigor of the training, though standing out in its educational segment. 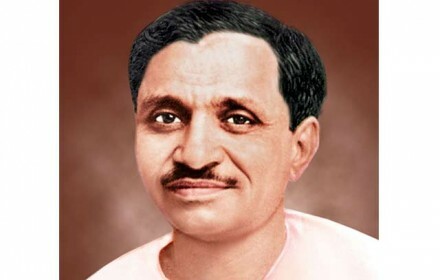 After completing his education and second-year training in the RSS Education Wing, Pandit Deendayal Upadhyaya became a lifelong Pracharak of the RSS. He worked full-time for the RSS and moved to Lakhimpur District in UP as an organizer and in 1955 became the Provincial Organizer of the RSS in UP. Pandit Deendayal established the publishing house ‘Rashtra Dharma Prakashan’ in 1940 in Lucknow and launched the monthly magazine ‘Rashtra Dharma’ to propound the principles he held sacred. Primarily it was meant for spreading the ideology of nationalism. Though he did not have his name printed as editor in any of the issues of this publication, there was hardly any issue which did not have his long lasting impression due to his thought provoking writings. During his tenure with RSS, he even started a weekly Panchjanya and a daily Swadesh. He also wrote the drama “Chandragupta Maurya” and penned the biography of Shankaracharya in Hindi. He translated the biography of RSS founder Dr. K. B. Hedgewar from Marathi to Hindi. His other renowned literary works include Samrat Chandragupta (1946), Jagatguru Sankaracharya (1947), Akhand Bharat Kyon? (1952), Bharatiya Arthniti: Vikas Ki Disha (1958), The Two Plans: Promises, Performances, Prospects (1958), Rashtra Jivan Ki Samasyayen (1960), Devaluation: A Great Fall (1966), Political Diary (1968), Rashtra Chintan, Integral Humanism and Rashtra Jivan Ki Disha. In 1950, Dr. Syama Prasad Mookerjee, then Minister at the Center, opposed the Nehru-Liaquat pact and resigned his Cabinet post and joined the opposition to build a common front of democratic forces. Dr. Mookerjee sought Shri Guruji’s help in organizing dedicated young men to pursue the work at the political level. “If I had two Deendayals, I could transform the political face of India”!! However, the sudden and untimely death of Dr. Syama Prasad Mookerjee in 1953 left the entire responsibilities and burden of the organization on the young shoulders of Deendayal. He served as the General Secretary for nearly 15 years and raised the organization with high spirits and enthusiasm, thereby making it one of India’s strongest political parties. By 1957, Bharatiya Jan Sangh had 243 regional and 889 local committees. At the 14th annual session of Bharatiya Jan Sangh in Calicut in December 1967, Pandit Deendayal was elected as the president. Pandit Deendayal was convinced that India as an independent nation cannot rely upon Western concepts on individualism, democracy, socialism, communism, capitalism etc. to which Indian National Congress succumbed to remain in power. Pandit Deendayal wanted to raise and grow India on the basis of its rich culture and not western concepts left by the British at the time of their departure from the nation. Although democracy was established in India instantly after independence, Deendayal was a little apprehensive about this take of India after these long years of slavery. However, he believed that democracy was India’s birthright and not a gift of the West. He was of the view that the Indian polity after independence has been raised upon these superficial Western foundations and not rooted in the timeless traditions of India’s ancient culture. He was sure that the Indian intellect was getting suffocated by Western theories and ideologies and consequently there was a big roadblock on the growth and expansion of original Bharatiya thought. “We are pledged to the service not of any particular community or section but of the entire nation, every countryman is blood of our blood and flesh of our flesh. We shall not rest till we are able to give to every one of them a sense of pride that they are children of Bharat Mata. We shall make Mother India Sujala & Sufala (flowing with water and laden with fruits) in the real sense of these words. As Sashapraharana Dharini Durga ( Godess Durga with her 10 weapons), she would be able to vanquish evil; as Lakshmi she would be able to disburse prosperity all over and as Sarasvati she would dispel the gloom of ignorance and spread the radiance of knowledge all around her. With faith in ultimate victory, let us dedicate ourselves to this task”. These notions revolve around the basic themes of harmony, primacy of cultural-national values and discipline. According to Pandit Deendayal, the primary concern in India must be to develop an indigenous economic model that puts the human being at center stage. It is opposed to both western capitalist individualism and Marxist Socialism. The philosophy of Integral Humanism advocates the simultaneous and integrated program of the body, mind, intellect and soul of each human being. His philosophy of Integral Humanism, which is a synthesis of the material and the spiritual, the individual and the collective, bears eloquent testimony to this. In the field of politics and economics, he was pragmatic and down to earth. He visualized for India a decentralized polity and self-reliant economy with the village as the base. This concept of ‘Intergral Humanism, which is deeply embedded in the Indian psyche, became the guiding philosophy of the Bharatiya Jana Sangha (Now the Bharatiya Janata Party). Deendayal was active in India’s political life from 1937 to 1968. For 16 years (1951 to 1967), he was General Secretary of the Bharatiya Jan Sangh. He emerged as an all-round national leader but when this seasoned leader emerged as President of his party, destiny took him away from us in a mysterious and gory end. He was the Jan Sangh President for only 43 days from December 29, 1967 to February 10, 1968. Around 3.45 a.m. on Feb 11, 1968, the lever-man at the Mughalsarai station informed the Assistant Station Master (ASM) that about 150 yards from the station, towards the south of the railway line, a dead body was lying near the electric pole. The police was alerted and the ASM sent a memo to the police on which was written: “Almost dead.” The doctor examined the body in the morning and declared it dead. When the dead body was brought to the station, a curious crowd gathered there. Till now, the dead body was unclaimed. Then one person in the crowd shouted, “This is the Bharatiya Jan Sangh President, Pandit Deendayal Upadhyay.” The news spread like wildfire and the nation was plunged in grief. The budget session of Parliament typically starts in February. The Bharatiya Jan Sangh meeting was scheduled to be held in Delhi on February 11, 1968 and its new President was to participate in it. Upadhyay was in Lucknow on 10th February. In the morning, the organizational Secretary Ashwini Kumar telephoned Upadhyay. He said that since the budget session was likely to be prolonged, he should be present at the Jan Sangh Working Committee meeting at Patna on the 11th. After talking it over with the newly-elected General Secretary Sunder Singh Bhandari, Upadhyaya fixed up his program to go to Patna. The train (Pathankot–Seyaldah Express) left Lucknow at 7.00 a.m. The then U.P. Deputy CM, Ramprakash Gupta, and former Jan Sangh President, Peetambar Das came to see him off. At midnight, the Jaunpur Ruler’s personal secretary Kanhaiya Lalji Pandit came to see him at Jaunpur station. He handed over a letter from the Ruler to Upadhyay. The train left Jaunpur at 12.12 a.m. and reached Mughalsarai. Seyaldah–Pathankot Express did not travel straight to Patna. It reached Platform No. 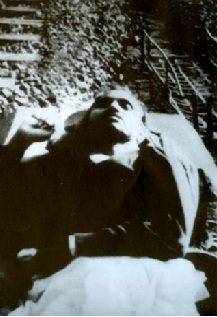 1 at 2.15 a.m. and the bogey in which Deendayal Upadhyaya was travelling was disengaged from the train and was joined to the Delhi-Howrah Express after shunting. It left Mughalsarai around 2.50 a.m. It reached Patna in the morning, but Pandit Deendayal was not there in the train. Meanwhile, the dead body had been identified at the Mughalsarai station. The Jan Sangh President was dead. The parliamentary committee was in session at Delhi. It was adjourned and all the leaders reached Delhi where his body was brought. Pandit Deendayal used to stay at parliamentarian Atal Bihari Vajpayee’s residence at 30, Rajendra Prasad Marg. His dead body was brought there. The first Jan Sangh President, Dr. Shyamaprasad Mukherjee, was also a victim of a political murder. The mystery remains unsolved to this day. Perhaps it will never be solved.